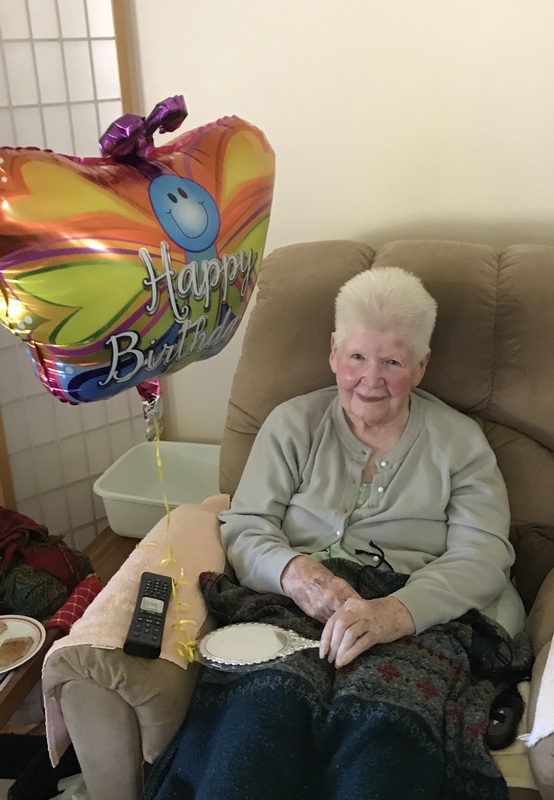 On April 17, my 96-year-old mother passed away after a short stint in hospice care. She died surrounded by those who loved her, in the home that had been her castle for 62 years, just like she wanted. Who could ask for a better passing? 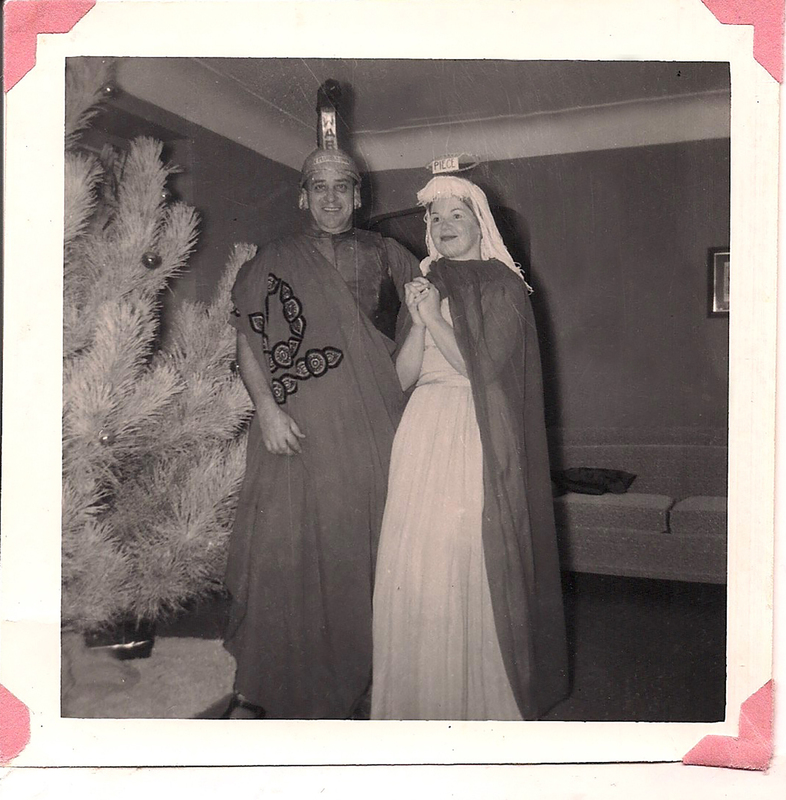 Dad and Mom, New Year’s Eve 1957, in the living room. For the past several years I’ve been living in this house that I grew up in, coming and going while managing her end-of-life care. She and Dad bought it in 1956. I was barely one. Childhood there was a war-zone. Dad eventually left and Mom soldiered on, but it wasn’t really a happy home. 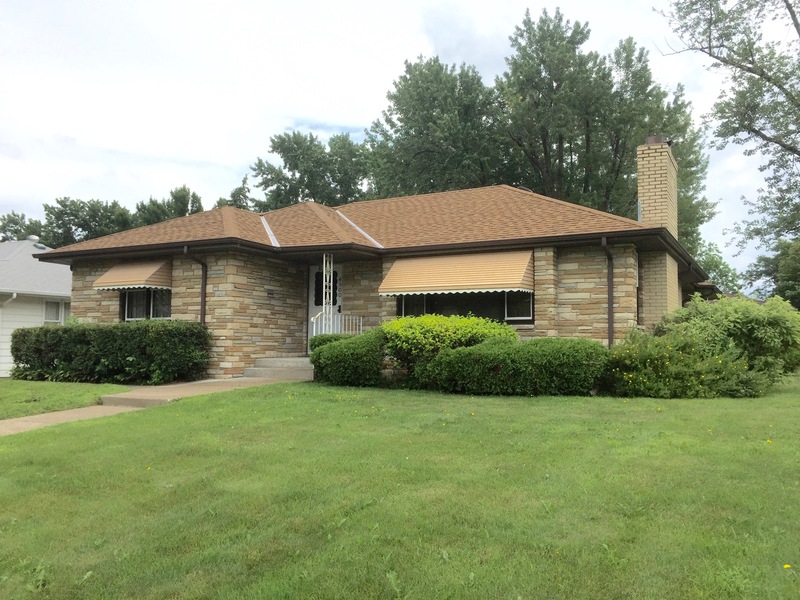 After she retired, she lived alone for 34 more years under this roof. In those latter years, the vibe of the house morphed into a solitude that comes from triumphing over adversity. Despite my father abandoning her and his four kids, she got a job, raised us, and bought and paid for the house with her own money. She didn’t have much but she managed it smartly, using the equity in the house to keep it well-maintained. After she retired, she grew gardens, mowed her lawn, wrote poetry, read voraciously, and joined a bowling league. Her best friends were the four of us, the waitresses at the cafes where she ate lunch, and the clerks at her grocery store. She swam and walked and lived simply in her peaceful home in solitary independence. Mom made me promise that I would make sure she could die in her home. So when she could no longer care for herself, I found personal attendants Terry and Victoria on Craig’s List. The equity in the house paid their wages. We all moved into her house together and I eventually found a county program to pay them. Terry and Victoria became her sisters, her constant companions until the end. Thankfully Mom’s house had three bedrooms and a finished basement. Since her passing, I’m in contact with her. I can feel her presence when I need her, not much different than when she was alive. Whenever I had a bad day or something big happened, she knew before I told her. She would often “send out a vibe” that I was to call her, and I would get the message to “call Mom.” While being able to talk to her in Afterlife doesn’t stop the sorrow of her passing, it’s profoundly comforting to have her guide me through the pain. I cleared my calendar to administer her estate. There wasn’t much to do; her belongings were minimal. I began slowly listing stuff for sale. Some of the bigger items sold, but smaller things weren’t moving. 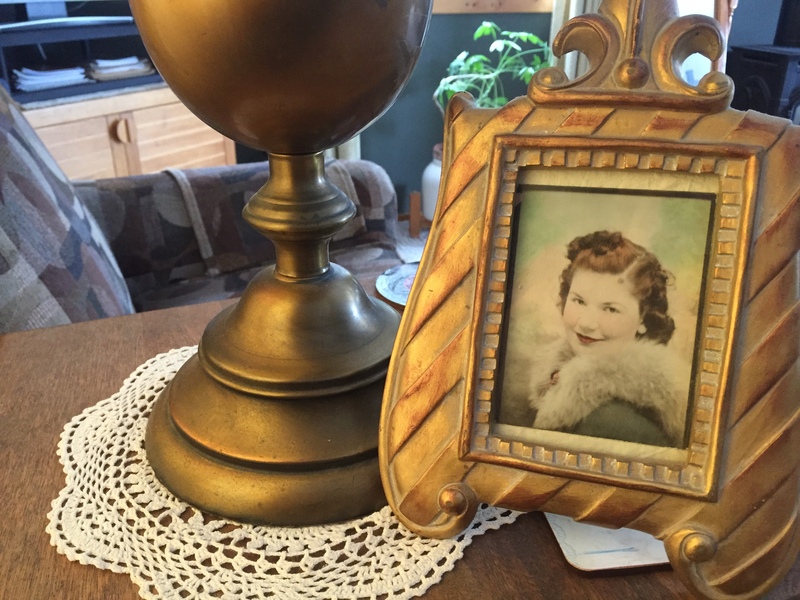 In the freshness of my loss, I was not ready to just box up Mom’s possessions and drop them at a thrift store, even though I could clearly hear her say, “It’s just stuff!” I decided to do a giveaway. I thought she could be part of bequeathing her stuff to these strangers who answered the ads. 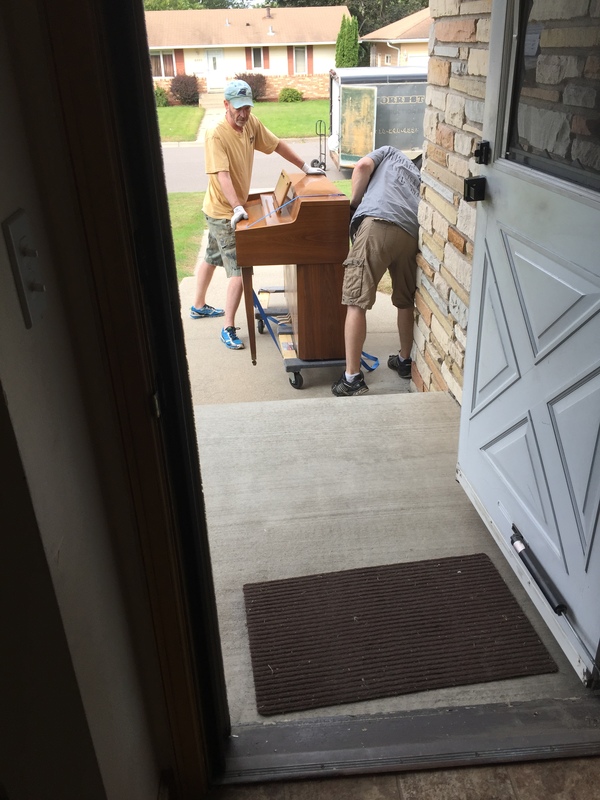 Everyone who came was so kind and appreciative, sometimes driving across town to retrieve something like an under-the-counter plastic light that must have been 40 years old, or a badly cracked desk chair floor protector. The kindness of these strangers for my loss and their appreciation to receive the giveaway was a warm comfort in the face of the sadness. No doubt Mom was happy seeing how it was helping me. Through the summer I lived in this continually emptying house. When someone came to take away another piece of Mom’s life, time and memories peeled away like layers of an onion. In the emptiness, she appeared to me at various stages of those 62 years, but mostly the years after everyone had left and she had the house to herself. Comfort came from realizing that, after all the pain and loss she suffered early on, she eventually found peace living a solitary, independent life, in love with her family and her home. 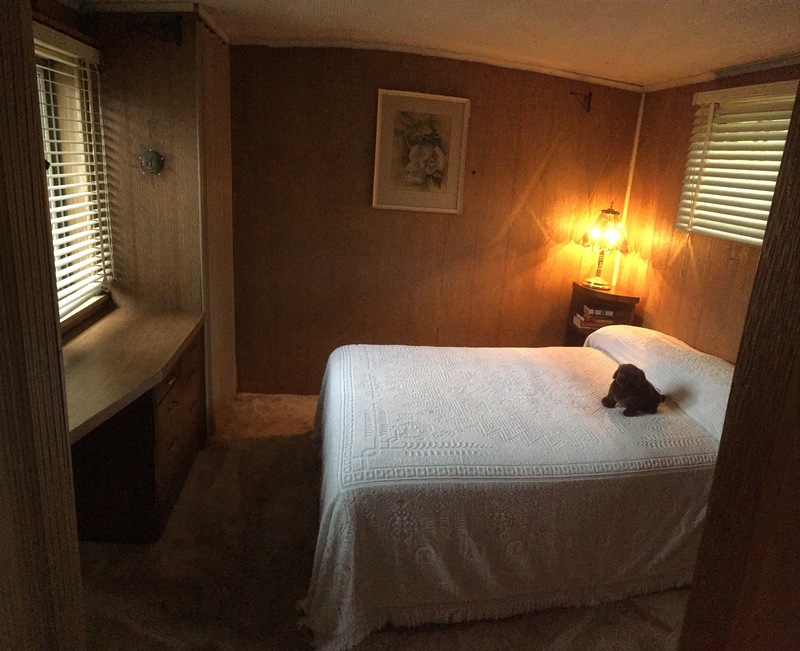 While divesting her stuff, I stayed in the back bedroom, the one I had when I was eleven. In that empty house, the shadow of that 11-year-old girl unexpectedly emerged one morning, panicked that the only person who ever stood to protect her was now gone. One night 50-some years ago, she witnessed my drunk father kick my mother down the back stairs from the same bedroom window. When she couldn’t stand it any longer, she ran out to confront them, screaming, “STOP! Just STOP! STOP HURTING EACH OTHER!” They were stunned, after a lifetime of me silently enduring their endless war by hiding in my bedroom or fleeing the house. Shortly after that, my father packed up and left for good. As he knelt in the dining room to tell that 11-year-old that he was never coming back, she was traumatized, literally torn in two: part was so relieved that the war would come to an end, and part was completely panicked that her father was leaving, forever, because of her. This 63-year-old, however, reached out to life coach and Conflict REVOLUTION trainer Robin Cordova. Together we found that child and attended to her. I created the intention to learn to mother her in ways I never received at that age. It was painstaking work, some days liberating, other days overwhelming, especially while mourning Mom. But step by step, we brought her into the light. Robin asked me to ask her to share something about herself that I might not know. She quickly replied, “I am super psychic and slightly autistic.” As an adult, I know the challenges being psychic has presented me. What must it have been like for this 11-year-old girl, growing up in a war zone? Alone in that empty house, one day at a time, I let myself feel everything she felt. She explained how frightened she was to know things, and to have senses that were so sensitive to sound, to light, to touch. I understand this now as the spectrum of what is called neurodiversity. As more layers of the onion peeled back to reveal the depth of this lifelong wound, we were now able to heal. Together we tapped into the fierce energy of my mother’s love that was wrapping around us from Afterlife and the power of the mother energy emanating from within us. With that, all of us began to relax and surrender, and finally rest. This gave me a whole new sense of compassion for myself, as well as for my mom. The house eventually sold. In the month before we closed, I set up my piano in the living room and spent my last days there playing music on the same spot where she breathed her last. She loved my music. In her final years, I got to play for her on the old piano I wrote so many songs on as a kid. But now that piano was gone, too. In the end, this home was Mom’s real husband, the structure that took care of her until death they did part. A very nice young man with a dog bought it, saying he fell in love with it the minute he set foot inside. Barbara: Good morning! It is Sunday, May 21, 2017. I am Barbara With, and we are here with the Party. Partyof12.com is where you can find all things Einsteinian from beyond the grave, news from the Party of 12, and of course information about Conflict REVOLUTION, our imagined Einstein’s miraculous process for world peace one person at a time, starting with you—or me. I’ll start with me, and you can start with you. Today we are coming from Lake Superior, on Madeline Island, on a beautiful day to be alive, as far as I’m concerned. I am excited about the show. I’m going to introduce our guest a little later, but first a recap. This is our fifth meeting this year, and looking back on the intention of the Re-Boot series, rebooting our operating systems was the intention for all of us coming together and participating in our own way in our own lives to create the perspective of world peace, one person at a time, starting with us. Over the past six months I have been to Standing Rock. I went to Paris and Copenhagen, to Tromsø, Norway, an island way close to the Arctic Circle. I was in Oslo. I went back to Standing Rock during the veterans’ gathering there, spent a bunch of time in Minneapolis. I went to Jamaica, then to Denver, Charleston, New Orleans, Corpus, and then back to Denver, and here I am again. I want to say thank you to the universe. I’m so grateful to be alive at this exciting time when we can change the course of defining who we are, defining our language. Our guest will help reiterate that as we redefine ourselves, we emerge as more generative, more peace-oriented beings, with peace generating from within us and spreading out into our local universes. I’m so grateful, and I hope you are, too. I’ve been formulating a new book in my head. I know I said I maybe wasn’t going to do that, but I’m inspired by this work, especially the work we’ve been doing. I’m thinking about the stories of Conflict REVOLUTION, how it’s miraculously transformed situations, lives, perspectives. That or a romance novel. Or maybe some erotica. I want to update on my Trigger of Trump. What triggered me about him in January was not him, per se. It wasn’t a direct mirror, but rather his opponents who wanted to call him out on his bad behavior but refused to look at that same bad behavior in their candidate. That was my sound bite, which you can clearly see revolved back to me and gave me plenty of room to learn about darker parts of myself that might be perpetuating these things. This led then into the next few months of the conflict of “Assumptions and Miscommunications,” where I perceived somebody was making assumptions about me, and so I started to revolve it and found out how many times I made assumptions. This has gone on as the year as progressed, and what I’ve learned is: the fewer assumptions, the more synchronicity. That’s my personal testimony of my life. I can’t prove it. You know that I’m kind of a scientist and I keep track of these things, and it appears in my life that synchronicity has greatly increased, on a daily, an hourly basis. That’s exciting. To sum up: when you’re doing Conflict REVOLUTION, you have to be prepared to go on a journey where you don’t know where you’re going. If you start out in January and think, “This will be about Trump”—a listener wrote in and said, “Yeah, I hate Trump, too.” And I thought, “No, that’s not quite it.” That’s not quite how Conflict REVOLUTION works. Which led to me and the trainers Robin and Cathy presenting “Conflict REVOLUTION 101”, which is available. You start out where you think you’re going and you end up somewhere better and much different than you could imagine. So I get synchronicity after following this lead. Anyway, you can look up that episode, I think I’ve also linked it to the Conflict REVOLUTION page at Partyof12.com, if you want to find out the process. It’s a process. It has a lot of leeway for you to build the process to absolutely fit your own needs and worldview. That’s the idea. This isn’t about me telling you how to do it, it’s about me showing you how it works and then you making your own operating system for yourself, for how it fits for you. It’s such exciting work. I wanted to report some of that good news. I also want to say that I’ve had a very strange experience that I want to continue to share on this particular set of airwaves, because this is why I created this set of airwaves, so I could share these things. A very old friend of mine just passed away, Lonnie Knight, an amazing musician, a man I played in bands with when I first got into music when I was 17. I met him when I was 17. When I was 18 and 19 we were in bands traveling back and forth from northern Minnesota down to Austin and back again, the trio of him and me and Fred Argir, who is also from northern Minnesota, who moved to Austin. So I joined in and got to post pictures of him and me hugging in 2013 and things from the past, we got to share all of that. It was a very unusual experience, especially because you know me to be somebody who talks to dead people, so knowing that when he passes anyway as I’m working with him, and he’s saying, “Maybe I can’t make these gigs because I’ll be too tired from chemo,” and I wasn’t going to say, “And what if you’re dead?” You just don’t do that when someone is still alive. And now here we are. He’s not really dead. I mean, he’s passed away, but now he’s having a new experience, a new relationship, with me, anyway. I’m going on with Fred to do a tribute to him, so now I’m learning all his music and it’s becoming the kind of joyful funfest that I usually have when I’m connected with people who have passed who are seeking to help be a part of the new definition we’re creating. Yes, it’s sad that we die, but on the other hand, if there’s an afterlife like Einstein has clearly explained ad infinitum for 30 years, then it’s just a new state of communication, of how we communicate. As we teach here, in [our] Einsteinian World, a huge part of it is the non-physical, even when we’re in our bodies. Even when we’re alive right now, 90% of this is a non-physical experience in the physical world, which is a tiny bit of it. But the most important part, if you’re going to be a human being, is to get into that three-dimensional, four-dimensional world in your body and perceive the human experience and live it. And now people like Leslie [Stewart] and Ken [Routson] and all of us here on the Einstein network devote ourselves not only to understanding the map of the non-physical but intending to use it for the benefit of the good of the whole at the root level. The commitment that we want to make decisions in our lives for the good of everyone involved in whatever that is, whether it’s family decisions or work decisions or decisions about one’s own inner life. We’re working for the good of the whole system. Otherwise, why would you put old, used, charred spark plugs in your car? You need all systems running well. So it will be an interesting time putting this band together and having Lonnie present. And Fred, too, has reported that Lonnie has come to him and in his young, sassy way, which I can totally see Lonnie doing (laughs), telling him to “Get over it!” Being off, busy learning. Plus, I gave Lonnie Einstein et al. : Manifestation, Conflict REVOLUTION and the New Operating System a few months before he passed, and he said he was anxious to tear into it. So who knows with that story? I am grateful for all of this study in afterlife that we’ve been doing together. In a little bit we’ll bring on our special guest today, Ken Routson. If you listened to last month’s Re-Boot, we had Ken’s spiritual partner Leslie Stewart talking about joy, a fabulous episode. If you missed it, download it, please! It’s amazing. There was some wonderful follow-up with my sister. Let’s just say, without going into too much detail, that joy did show itself in that situation we talked about. I met Ken a long time ago. I bought his first book, Beliefology: Raise Your Consciousness to Wealth, Health & Happiness! I was flummoxed at how Einsteinian it was in its core redefining of what we believe in. I don’t think we had much communication then. 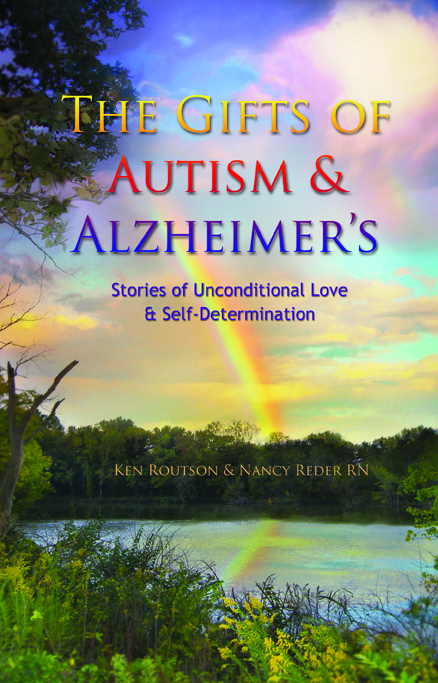 But when he came to me with his book The Gifts of Autism & Alzheimer’s to work with him as a publisher’s helper, like Santa’s helper, I helped with that book, which was really interesting to me. Before we bring Ken on, I want to share about the client I had, Dorothea, who changed my life, and her autistic son. I think he was 33 at the time, Nick. He was severely autistic; he had never spoken a word. He had the familiar Sufi-like hand movements. He was obsessed with shuffling cards and flipping through magazines. He made high, squeaky dolphin noises. But he and his mother had a telepathic communication. She felt all her life as if he talked to her in her head, so she hired me to channel him with the purpose of proving to her – or not – that she was really doing this. My presence with him, because he didn’t speak, most of it was non-physical communication, was completely mystic. It was the first time I’d sat in front of somebody who was in this state. I felt as if I were sitting in front of a mystic. While we were sitting by the river doing a reading, he got up and walked down into the woods, the wilder part of the Mississippi River in Minneapolis. She went running after him. He got to the river and she said, “He is so terrified of water. This is unprecedented, that he would just walk through there.” There were little creeks he had to step over. She told me was that she was going to see her daughter play at a county fair one day. She took the car and parked with Nick on a residential street outside the foregrounds. Nick usually sat in the car and waited. But that day he got out of the car and started walking down the street with great purpose. She got out of the car and started running after him. “Where are you going?” He walked five houses down, and with great intent picked a house, walked up the sidewalk and around to the back of the house, where he went up three steps that had no back on them—and that, too, she said, was something that would just terrify him. He went into the house, which was surprisingly unlocked. She ran after him, mortified, and came into the kitchen of the house. He had gone down the hall, in a room, and shut the door. She was standing there flummoxed. “What can I say to anyone who encounters us?” In a few minutes she heard the toilet flush. He retraced his steps and got back in the car. My experience with Dorothea is longer than that, but working with them inspired me to write the only screenplay I’ve ever written, Gravity. It’s about a theoretical Nick who can communicate telepathically and begins early, going into the dreams of Rose, who then becomes a famous author and is united with Nick and his mother and they go off on a journey to try to “cure” autism. Autism ends up curing them, as it were. That is my experience with the autism piece of it. And one last thing, about my mother. My mother, as many of you who have been with me know, has been successfully installed in her home that she bought in 1956 and paid for all by herself, with two amazing caregivers who are now part of our family. She’s very, very happy. She’s lost all memory of anything having to do with anything in her life. She doesn’t remember giving birth, my ex-husband. She remembers her children and her grandchildren. She watches the Game Show Network all day and sleeps a lot. But I’m so very blessed that I can go and share my sadness about Lonnie’s death and see how she’s doing. The funny thing was, on Mother’s Day, my sister Chris and I were visiting and I said, “Ah, President Donald Trump!” And she said, “Ha ha ha! That will never happen!” We had to break the news to her. She was quite shocked, but of course it doesn’t really matter to her. It never would have anyway. But enough of me. 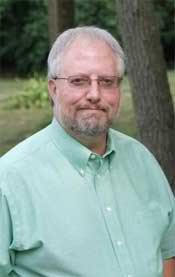 Joining us is Ken Routson, an author, speaker, consultant, life coach, and workshop facilitator. He’s been nationally recognized for his contributions in developing day programs and residential supports for people with disabilities. Welcome, Ken! Good morning! Ken: Good morning to you and everyone, those visible, those physical and those who are not physical! Barbara: (laughs) Which is quite a few! You have at your side Leslie Stewart, it’s a little bit of a two-fer today, maybe? Ken: Yes! In fact, I want to read a couple paragraphs that she wrote about her perspective about Mom, both the “old Mom” and the “new Mom.” [Ken’s mother before and after Alzheimer’s.] This is part of a chapter where she talks about her experience with Mom. I’d like to read the last two paragraphs of her wonderful, inspirational words. Ken: “This type of shift in mood is why it is so important for care providers to learn how to nurture and redirect anxious and agitated people by establishing rapport and cultivating an interactive atmosphere of trust and unconditional love and acceptance. One of the gifts of Alzheimer’s is the short-term memory. If the person is gently redirected, they will often forget their previous experience or event and come into the moment with their new activity. Mama Fern’s Alzheimer’s taught me that life doesn’t have to be over if we receive a bad diagnosis” That’s with any diagnosis, cancer, Alzheimer’s, anything. That’s me saying that. Barbara: Wow! So Mama Fern was your mother. Having gone through this whole thing with my mother and having to set my mother up and the stiff learning curve that any child goes through when you’re helping your mother who doesn’t have Alzheimer’s, it was stressful. What was it about your mother that started you to wonder if she was suffering from Alzheimer’s? I thought that they can’t really diagnose it as Alzheimer’s, or can they? Am I wrong on that? Ken: It depends on which neurologist or which doctor you talk to I don’t really think that there’s any one specific MRI or anything that could do that because also, I believe that some people, like Raun Kaufman with autism, his story was depicted in a very popular television show, I think it was in 1979, called “Son-Rise.” He was severely autistic, had many behaviors. The parents took him all over the country to find a school to help him, and every school they found not only their experience with him, but the other people in that school would have worse behaviors after they attended school than before. So they sat down in their own living room. Raun liked to spin plates. They would sit down and spin plates with him; they entered his world. Ken: To back up a little, when taking care of my mom, I saw a lot of characteristics similar to those in people with autism I’ve worked with for forty-plus years. When I started studying the science of the brain and the science of Alzheimer’s and autism, it’s personal, from all of my analysis and research, it’s only my opinion that most—not all—Alzheimer’s is due to long-term, chronic stress and constant emotional turmoil that floods the body with toxic cortisone and other toxic adrenalin types of neurotransmitters, and that and inflammation burn up the immune system, causing the body to attack itself. My mom had real severe rheumatoid arthritis, where all her fingers and toes started to cross each other and curl up. I think almost all autoimmune disease, whether it’s fibromyalgia, cancer, or whatever, is due to long-term, chronic stress and resistance. Barbara: That makes a lot of sense to me. As I’ve looked at my mother, who has not only kept her wits about her, which is one archaic way of saying it, but has resisted the mainstream big pharma Western medicine pipeline. Granted, she had some prescription drug addiction, but she wouldn’t just jump and go to the doctor. I often wondered if the fact that my mother was so emotional—she was an adult in the ’40s, ’50s, and ’60s, when a woman was not supposed to be crying all the time, but she did anyway, and she was outspoken. And she had the attitude that life was going to take care of her, and it always did, very well. Even now we laugh that this is exactly what my mother would manifest. I don’t think she had the kind of stress that you’re talking about. Like you said, there’s not a particular MRI that you can take, but had she started forgetting things and a bunch of us had said, “Oh, you must be getting dementia, we’re going to prove you have that and define it as that,” who knows what definitions would have surrounded all that? Ken: Another reason I think a lot of people get Alzheimer’s is that they never got the joy of life. They’ve never enjoyed life. Happiness is a choice, and some people have trouble with that. They see the world as a struggle, as misery. In many cases, Alzheimer’s is God’s or nature’s way of acting as a natural anesthetic. Before, my mom was very much a worrier. She tried to control people’s lives even when we were grown. She was very uptight. She couldn’t sit and look at clouds. After, Leslie and I would take her for rides and she would just look at clouds for 45 minutes and talk about how beautiful they are. She was so much more peaceful. Except for when people were trying to control her, like, when we would take her home or my sister took care of her or she went back to the nursing home or assisted living, she would have behaviors. Ken: It was a blessing, because she was so much more relaxed when she had Alzheimer’s than she ever was before. Barbara: Wow! Plus she could go to California! Ken: At first I went through all the stages of loss that Elizabeth Kübler-Ross talks about, the anger, the bargaining. And at the end, I found acceptance, and once I made peace—that’s so important in any diagnosis, especially terminal diagnoses—once you make peace with it, you can see the gifts. When my mom died, I went through the loss of two mothers, the one who was very controlling, a worrier, who was very nervous and uptight, and the last mom who was so child-like, like the beautiful, inspirational passage that Leslie wrote. Life is good if we get out of our own way. Ken: You had mentioned about synchronicities earlier. Leslie and I are starting to see where almost every 10 minutes we talk about something, and then we turn on the television and they’re talking about it. You pick up a book, and whatever the last question you had was, the answer is there. Life is for us if we get out of our own way. Barbara: I think there’s an uptick in it. I can’t tell if it’s because I’ve come through something or because we’re all going through it together. Ken: I think it’s an acceleration of energy, everything. So many people are unconscious. Thanks so much for all your Einsteinian work, because as I talk about in Beliefology, we all have been so unconscious, and just now we’re opening our eyes to the beauty of the world, how life supports us at every turn if we just get out of our own way. Barbara: I don’t want to go into any detail about my sister, but she did that. She got out of her own way and synchronicity brought a series of events that led her exactly to where she needed to go to get to that joy. The question I had asked, for those listening, was that my sister’s son was brutally murdered and of course, what a horrible, horrible thing! How do you bring joy to it? Barbara: Let’s go to Beliefology. I looked for my copy that I’m sure you signed, but I couldn’t find it, which is fine. I’ve downsized several times since then. But I do remember very clearly writing to you and saying, “Oh, my gosh! This is so Einsteinian!” or however I said it. And then I don’t remember how I got to you again. Ken: It came out in 1997. Because back in the ’80s, Leslie and I moved from Dayton, Ohio, to Fort Lauderdale. There were many, many people all throughout south Florida hungry for this information. The timing was great. What led me to my inspirational path was, I was born with severe learning disabilities, I had aphasia also. I could not fluently express myself until I was in the fourth grade. Ironically enough, later on, much of my career I was paid well for talking and communicating. Life is so fascinating. Ken: I had a massive inferiority complex and an alcohol addiction. When I was 19 years old, Spirit led me to an institution. I didn’t even know what it was. In fact, I was pretty high the first time I went. It was originally a sanitarium for people with tuberculosis. I walked up and they said, “You must be here to volunteer.” There were children there I never knew existed. I ended up volunteering in there for, like, 70 hours a week. It was like I had a purpose. I let go of the things that weren’t that good influences on me. I stopped drinking. I started to pick up and read every book I could about self-help, about psychology, the power of positive thinking. Suddenly I ran into the Seth material. I’ve always been a curious person, and the Seth material put all those pieces into a cohesive, comprehensive understanding of how we create our reality. Ken: As I traveled the country doing Seth seminars, many of my students had people, family members, people at work they couldn’t share the Seth material with. The wanted a book that would explain things like what we call love and attraction and how we create our reality. As Seth coined so famously, as Jane Roberts wrote back in the ’60s, “You create your reality, and the point of the power is in the present.” They wanted something that didn’t have all of what regular people thought was “ooga-booga.” So I came out with the book Beliefology: Raise Your Consciousness to Wealth, Health & Happiness! And talk about how your life reflects your beliefs! Change your beliefs, transform your life. Our beliefs are like magnets, just like a garage door opener. People can believe that that little gadget can open the door or the remote can control the TV, but so many people have trouble thinking that you attract everything, 100% of things in your life, according to your beliefs and emotions and ideas. Barbara: I think people often don’t think that at least from our Einstein model here that the universe is flowing out of us, through our bodies, which is the projector and perceptor of the universe. Ken: Like the television, the radio stations. You have all those electromagnetic data that have to have the TV, just like the computer. We are the terminals or the computers for our inner self. In your introduction, you were so right. Everything physical has a non-physical counterpart. The physical is such a small part of what Seth calls the framework to inner reality. Barbara: I ate up those Seth books when I was very young, too. I was always impressed by the science end of it. It seemed more scientific to me than it did spiritual. Barbara: When your book came out? Ken: The new edition. It originally came out in 1997. It sold like hotcakes. Oprah did not yet have that Secret that got a lot of people into the law of attraction. The timing on the first edition was great. But many people wanted it, and it was out of print. That’s why in 2007 I decided to do a second edition. Before the Internet and Facebook, I had many letters from people all over the world telling me how Beliefology changed their lives, and how it was so simple. They also liked how I talked about how especially because of the paternalistic, hierarchical God, how in society we have created God in our human image instead of feeling what Father-Mother God is. In Beliefology I go into our beliefs that we’ve been taught about God. It’s very important for us to develop our own personal relationship with the God of our beliefs, the Christ-consciousness that I think is more than just for Christians. Barbara: Yes. In our map Compassion is the fifth fundamental force of the universe. Everything overlaps there as well. So much overlapping in that system. And I can see why people—I often feel the Einstein work is too complex. I want something simpler, which is why we did ConRev 101, very basic, parboiled-down to the basic, basic stuff. It’s the theory of everything, the maps of the entire universe and how matter is manifest. It’s a lot of information. How much don’t we need to get to the average person? Ken: It surely is. The sciences and data stuff—who wrote the wonderful, beautiful thing, speaking of politics? Ken: My favorite doctor. Everyone should read Mind Over Medicine: Scientific Proof That You Can Heal Yourself. And the doctor Peter Whitehouse, I’d like to read, if you don’t mind, his endorsement for The Gifts of Autism & Alzheimer’s. Barbara: Yup! That hits my sweet spot. I am so much a proponent of mind over medicine, and so far, so good. I haven’t been hit with some catastrophic thing, but every time I think, “I should go to the doctor and get some medicine,” then I respond, “No. My spirit will guide me to what I need to do to heal this.” So far, so good. Ken: Leslie’s title is one of my favorite titles of any book, Leslie’s and the people she translates for, the collective consciousness known as Orion. As that wonderful book says, Trust & Allow the Process of Life In-Joy! Barbara: And as I found out last month and even stated when we were talking, I was a skeptical person. There’s a part of me that resists the idea that there are times when you cannot be in joy, you just cannot. When you’ve just found out your son was stabbed 31 times on his front steps, you can’t be in joy. But yes, I have to say, after what I’ve seen happen over the past month, you can be so appreciative and excited and in the moment, like you’ve been talking about, the present moment, the miraculous moment when a mysterious force is creating this body and letting me send the universe out and bring it back to perceive it. That alone, regardless of what’s going on, is so miraculous that it changes your relationship to what’s going on. In that way you can bring change to what’s going on if it’s not joyful, or you detach from the physical world as the primary reality and go into the non-physical of eternal, unending energy. Ken: Do you have a play you wrote about your experience with the fellow with autism, Nick? Ken: Yes. My current research for my next book is Neuroplasticity and Epigenetics: Let’s Stop Scaring Ourselves to Death. Oh, that epigenetics! For you in the audience, Google “epigenetics” or “Joe Dispenza.” In Change the Habit of Being Yourself, he talks a lot about epigenetics. And Bruce Lipton talks about epigenetics, about how we create the genes, not the other way around, how consciousness presupposes matter. I would love for you to write a book on your experience channeling the autistic young man, expressing some of his feelings and thoughts. Ken: It’s was like that with Alzheimer’s, too, because they’re still there. I’m looking forward to you reading, if you would like at some point, I know you’re very busy, in chapter 8 in this book, it’s “Is Anyone In There?” So many doctors and scientists think it’s parts of the brain, like the hippocampus, where your memory is, that the afterlife experience, or when you die and come back, that that is a biological sensation and repercussion. I’d be interested in having your feedback and Einstein’s feedback on that chapter because this is important. This is a part of their spiritual evolutionary growth of Alzheimer’s. In my mom, you could see her explore other realities, and then she would come back to this reality. She wouldn’t know who I was or anybody else, she’d think I was her brother, and she’d always see her father. And the next week all of a sudden she’d be very lucid. Ken: I think Orion said Alzheimer’s is kind of like if you can imagine a DVD with all the tracks, and they just shift from track to track. We took my mom for a ride one time, she took us to the street where she had lived when she first came to Dayton, and over a three-day period she named all those people, she talked about all these people she had known in school when she lived there. She flipped back to that track on that DVD. I don’t know if it was after her death or right before, we found a scrapbook with all those people she had named, they actually existed in the late ’40s. Ken: And this was a person who did not even recognize us. So all of that’s in there. It’s not gone. Anybody listening to this or listening to or reading the files that I’m sure we’ll share, don’t put your loved one in a nursing home unless you just can’t take care of them, and if you do, go see them! So many people in my research put loved ones in a nursing home and they never saw them again because they said, “They won’t know. I would rather remember them the way they were.” And they miss such a wonderful part of this purposeful process that’s a part of life. So many people discovered what I did, that there is life after the Alzheimer’s diagnosis, not just for the people with Alzheimer’s, but also for the loved ones and the caretakers. There’s a gift there that can also help them in their life to learn mindfulness. That’s the biggest thing that my mom taught Leslie and me: mindfulness. Being in the moment. Barbara: It’s interesting you bring that up. That was my other experience with Alzheimer’s. It was in 1994 when I was first channeling groups and realizing that I could communicate with people who had passed on. My friend said, “My mother is deep into an Alzheimer’s coma,” whatever they call it, and whoosh! She appeared to me like a dead person. We started talking, and she said things like, “I want my blue blanket.” And my friend said, “Oh, my gosh, she wasn’t allowed to bring her favorite blue electric blanket to the nursing home.” She wanted her hot tub. Like you said, the family had stopped visiting her. She was just a vegetable. It led to a renewed interest in her family coming to see her. They eventually moved her out of that nursing home because they found out they weren’t treating her well, and they got her in a better place. Barbara: That confirmed the idea I have about Alzheimer’s and dementia, like you have said in your book, that it’s a protection, in a way, of aging, but also it’s a way to see other realms. I don’t know about you, but I’m always exploring in the non-physical. Ken: One of your initial questions was when we first saw signs. When she was in assisted living, Leslie would bring pictures of our vacations, and she would see animals or children that weren’t in the pictures. But then how do we know? And she’d look out the window when we’d go up our drive and she’d say, “Isn’t that a beautiful dress that little girl’s got on?” And Leslie and I started to think, “She is actually tapping into other frequencies, other probable realities that are actually there.” It’s amazing. There’s a chapter I wrote about the extraordinary gifts of autism and Alzheimer’s, about people with autism, savants, like the one guy, he’s an autistic savant like Rain Man, and he would go over Paris or New York in a helicopter, get back to his studio, and draw the skyline exactly, without missing a building or a window. Barbara: Wow! I’ve been appearing on a radio show, “Mack Maloney’s Military X-Files.” They have all sorts of fascinating stories. We were talking about remote viewing. Psychics have a specialty, what they do naturally. For whatever reason, my psychic gifts were married to Einstein, which is great. I don’t think I could do that kind of accurate remote viewing, but that’s what he’s doing. He could go to work for the military. Ken: Leslie wrote me a note here that I should mention about the time in the hospital when she looked out the window and she said, “Oh, there’s Russia!” and she started to name cities and places in Russia that I don’t think she knew physically in her non-Alzheimer body and brain. The human mind is amazing. We scientists and metaphysicians like ourselves haven’t scratched the surface of the mind-body-spirit connection. Barbara: And we are just barely understanding the structure of how matter is manifest. I personally happen to think that this body of work I’ve done for Einstein is pretty complete, but even with E=mc squared, it took decades before people would recognize what Einstein had done. I was telling the story on that radio show about the time in 1983 when I was living in kind of a haunted house on Madeline Island. The owner had left and asked me not to let anybody come and party in the house. I woke up in the middle of the night to a big party. I was going to tell everyone to leave, and as I opened the door from my bedroom to go downstairs, there was no one there. This happened three times, until I just willed myself to go to sleep amidst the party. Barbara: Then in 1994 I was married in that house. I had an abreaction the night of my wedding, of listening in the same room I had been in to the party and going back to 1983. That opens up questions about, like you’re saying, the amazing body-mind-spirit connection and also, how is it that there’s a wormhole through time where I can hear 1994? Barbara: And I don’t know what the answer is, but that’s what I believe happened. Ken: Seth talks about the multi-dimensional reality we all live in, how all time is simultaneous. I love stories like you just told. They’re fascinating and thought-provoking. Barbara: I want you to talk once again about your new book. Ken: Neuroplasticity and Epigenetics. Neuroplasticity is how we can rewire our brain and our whole neurological physical biology. Epigenetics is about how we turn on some genes and turn off some genes by our beliefs and our lifestyle. That’s why there are families where many people are very severely diabetic, but one or two aren’t, and that is because of their lifestyle, their belief system, their emotional demeanor. Attitude is everything. They turn off those propensities of genes and chromosomes that have a probability of leading to becoming diabetic and affecting your pancreas. It’s so much about your beliefs. That’s why Bruce Lipton, who wrote The Biology of Belief, talks about epigenetics. The rest of the title is Let’s Stop Scaring Ourselves to Death. Barbara: (laughs) I love that! Ken: Because we do such damage, including me. I picked up a lot of the worry characteristics from my mom. Orion talks about learning how to change our habitual responses, our habitual emotional responses, how to get in touch with that. And Joe Dispenza, with the wonderful title of his book, Changing The Habit of Being Yourself, because we’re habitual creatures. That is the toughest job, the essential prerequisites to being a deliberate creator, creating the life of your choice, or allowing it. It happens when you get into a partnership between your physical ego self and enhance that partnership with your inner oversoul self. Barbara: Yup. We call it aligning to Compassion, where the whole system is operating just as it was designed to do, where Emotions are flowing, and as they flow, they bring the voice of Intuition, which is the voice of Compassion, and they hit the Intellect and they get defined in some way. That I think is the place where we start to redefine. We’ve been taught to define Emotion in such a way that people limit it and suppress it, which is part of inflammation and illness. But when we can start to marry even the worst-appearing emotions of anger or sadness to a deep, regenerative definition, this is the beautiful, passionate part of you! Let it flow! Take a breath! Ken: Energy emotion, the energy in motion, and where the mind goes, energy flows. Barbara: Our time is up. Thank you so much, Ken and Leslie! Ken: Oh, absolutely! Thank you for all of your work. Your work with autism has totally fascinated me. I’ll want more. You haven’t quenched my thirst yet. Barbara: (laughs) OK. I’ll pull out my treatment for the screenplay and send it to you. I had thought this morning that we would do a channel, but I’ll forgo that for right now. Thank you, everyone, for coming. Next month I have an open slot. I don’t know who will be with us, but hopefully it’ll be someone at least half as fascinating as Ken and Leslie have been! Thank you so much. See all Barbara’s products and services at www.barbarawith.com.